Better suited to light rock than deep drum 'n' bass. If the iPhone has an Achilles' heel when it comes to music and movie playback, it's that the stock earbuds don't really do either justice. They're too reedy and harsh for that. It makes sense then to upgrade the standard cans as quickly as possible, which is where the Apple in-ear earphone with remotes and mic come in. For £54, these cans replace the standard earphones with a shaped design equipped with silicone sleeves in small, medium and large sizes, that fit more snugly into your ear. This has two benefits - it cuts down on ambient noise, enabling you to listen at lower volumes; and gives your iPhone a substantial boost in sound quality to boot. As you'd expect from the name, the Apple in-ear earphones with remote and mic also include a small inline controller with -/+ volume controls plus a simple switch that enables you play or pause a track, with two clicks skipping to the next track. Pressing the remote quickly three times sends you to the previous track. A microphone for hands-free calling is also built into the same housing. Fire up some tunes and the Apple in-ear earphones with remote and mic certainly live up to their promise - you're rewarded with substantially better quality than the standard buds with a crisp, clear treble and a realistic presentation of voices and instruments. With a frequency response of 5Hz (low-frequency) to 21kHz (high frequency), the Apple in-ear earphones are unlikely to please deep bass fiends, and boosting the bass using the iPhone's EQ settings simply results in plenty of audible distortion. You also have to be careful not to push the Apple in-ear earphones too far in your ear. It's easy to do because the silicon sleeves and the lightweight design of the earphones makes it feel as if they're about to fall out. Stick them in too deep and the result is woolly, closed-in sound with distorted bass, although you soon get used to getting the balance between a snug fit and clean sound right. The only real problem you will encounter is with the inline remote. It's placed high up on the right ear cable which ensures you can't really see it by looking down, forcing you to switch tracks and tweak the volume by feel - something that's not particularly easy thanks to a lack of tactile feedback. Maybe that's just as well. The inline remote's volume controls plainly don't work with the iPhone, forcing you to use its physical or touchscreen buttons instead. That's ironic given that many buyers on the UK Apple Store are specifically buying these cans as an iPhone upgrade, even if Apple doesn't go out of its way to list them. Officially Apple says the cans' remote and mic "are only supported by the iPod nano (4th generation), iPod classic (120GB) and iPod touch (2nd generation)", almost none of which have use a microphone. At least the microphone does work on the iPhone, but that still makes these cans a big of a curate's egg as far as upgrades go. There are some neat touches however. 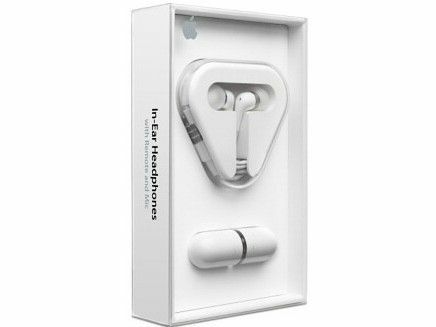 The Apple in-ear headphones with remote and mic come bundled with a triangular case for storing the cans when not in use. They also have a large pill-shaped carrying case for the other silicon sleeves, with one end for large sleeves and the other for small. It's weird though that Apple has paid attention to small details like this, while missing out offering a better inline remote. The Apple in-ear earphones with remote and mic then are a bit hit-and-miss. They're a worthy upgrade if you're stuck with standard iPhone cans, but only as long as you don't mind that the inline volume controls don't work. Luckily Apple lists plenty of fully-functioning alternatives on its UK Store. It's just such a shame it can't offer a simple fix itself.